Trigger was one of my absolute favourite books of 2016 and Pathogen was even better. Here, Kate and Andy work together to end a medical outbreak in a small town near Whistler, BC. The plot feels tighter here. Kate and Andy’s roles are clear from the start and the focus of the story is on the small town hospital where Kate finds herself working on behalf of the RCMP. The action in this story is terrifying. As Andy and the RCMP search for the person who deliberately started and spread the outbreak, Kate and the medical staff attempt to keep a growing number of patients alive in a small town hospital. There were a few moments where I had to suspend disbelief – it is hard to imagine that these patients would have been treated at a small town hospital and that the national or provincial disease control bodies wouldn’t have taken over from Kate’s small team much earlier. But I enjoyed the House-like medical science and Kate’s strain as her patients started to die. The pacing of this story is perfect and I loved the whodunit element as Andy investigates the characters in a rather eclectic small town. Kate and Andy are a couple this time and I loved them together. The contrast between their unflinching professional selves and the gentler, softer way they are learning to care for each other is beautiful. I didn’t always understand the conflict between these women, but I fully understood the connection and chemistry that continues to make them a favourite fictional couple. I love the fact that Kate and Andy live in Vancouver, my hometown. The author captures so many wonderful nuances about life in BC, giving this story a very satisfying and complex sense of place. This is such a great series and I can’t recommend it enough. I love these two strong women and their relationship – both professional and romantic – and I love the adventures they share together. Jessica Webb spends her professional days working with educators to find the why behind the challenging behaviors of the students they support. Limitless curiosity about the motivations and intentions of human behavior is also a huge part of what drives her to write stories and understand the complexities of her characters and their actions. When she's not working or writing, Jessica is spending time with her wife and daughter, usually planning where they will travel next. Jessica can be found most often on her favorite spot on the couch with a book and a cup of tea. 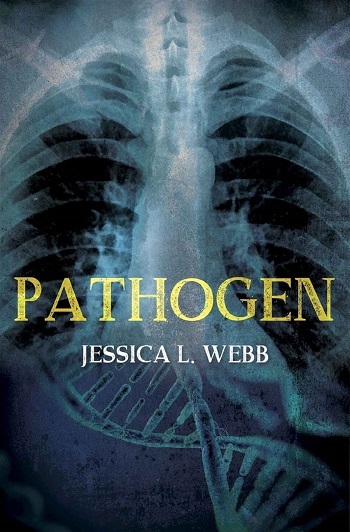 Sarah reviewed her personal copy of Pathogen (A Dr. Kate Morrison Mystery #2) by Jessica L. Webb for this post.